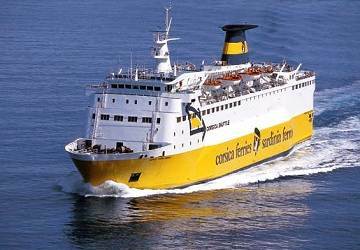 The Corsica Marina ferry can carry up to 1500 passengers and 550 cars. 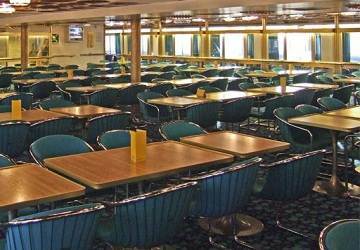 Onboard you’ll find a self-service restaurant/cafeteria, a bar, shop, children’s play area and a solarium. Please Note: Whilst we have taken great care in making our Corsica Marina guide as accurate as possible, onboard facilities, services and entertainment may vary depending on the date and time of year that you travel, facilities mentioned may change without notification and ferry companies reserve the right to operate vessels other than those mentioned at time of booking without prior notification. We traveled on a mid week ferry from Livorno to Bastia after a short visit to Florence and Pisa. Leaving at 11am arriving at 3pm and with a cost of only 22 Euros one way, this was a very comfortable and stress free way to get from the Tuscany area to Corsica. 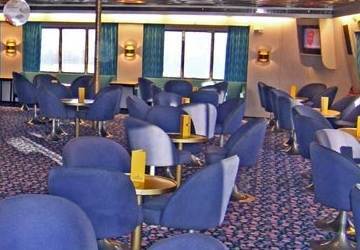 We very much enjoyed relaxing in the lounge and dining areas and taking a couple of hours on the open decks to enjoy the sun on the way over. Overall the quality of service and standards of the ship is very high and we also appreciated that all announcements were given in English, as well as French, Italian and German. The only surprise was the cost of the taxi from Pisa to the ferry which was 65 Euros. We might explore taking the train from Pisa to Livorno as an alternative in future. Everything was fine and correct. "I will use it again"
Both the outward and return trip between Livorno and Bastia were enjoyable. The ship left on time but the arrival time depended on the weather conditions, which did not differ much from the planned arrival time. The crew was helpful during embarkation and disembarkation, which also went smoothly. Catering was ok. The best part was the open deck and the widespread availability of loungers. Which can be placed anywhere on deck. We had a lovely time sitting in the sun, a nice start and end of the holiday. Apart of a massive delayed for return trip the rest was fine. East and quick boarding, don't expect a luxury cruise, it's a simple ship. The food on board is simple but fine. The trip was well organised, left port on time, arrived on time. lots of staff who spoke english for us non french speaking people. All happy, no complaints. Easy checkin, bus to ferry from terminal, escalator to deck which was great with heavy suitcases, luggage room to store suitcases during sailing, clean ferry, smooth disembarkation. Only issue, we were told there were shuttle buses from the terminal running into Livorno. However, the only buses we saw at 6 pm on our arrival were all locked up at the exit gates so we had to walk into the main town centre. We didn't use catering so can't comment on the food but the main dining area looked very elegantly set up. The route Bastia-Livorno on the 07/09 was very very late. Dirty ship because of the people everywhere. We had a wonderful trip, only had a few delays which apparently were as a result of the busy period. The sun on deck made waiting for the ship to arrive bearable. The boat left on time and the staff were very efficient and competent. The food was good and the staff were prompt to deal with any spillages or problems. We were foot passengers and we were well looked after. Would recommend.